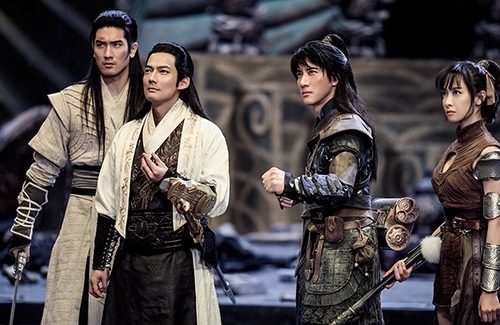 Starring Leehom Wang (王力宏), Victoria Song (宋茜), Godfrey Gao (高以翔), and Karena Ng (吳千語), China’s first video game to movie adaptation Legend of the Ancient Sword <古剑奇谭之流月昭明> dropped its action-packed trailer to prepare the fans for its nation-wide release October 1st. The action-adventure film stars Leehom as Yue Wuyi, the son of a wealthy merchant who is fascinated with the ancient arts. In his journey of cultivation, he bands with Wen Renyu (Victoria Song) and Xia Yize (Godfrey Gao) in his search for the talented master Xie Yi (Archie Kao 高聖遠). In their journey, they are stopped by Shen Ye (Chilam Cheung 張智霖), the grand priest of Liu Yue City. Legend of the Ancient Sword is adapted from the Chinese video game Gu Jian Qi Tian 2 <古剑奇谭二：永夜初晗凝碧天> and is directed by Renny Harlin. Interesting casting of 3 male leads – Leehom and Archie Kao from US and Godfrey Gao from Canada. And Renny Harlin from Hollywood. @michelle2805 none is hot for me lol! Confession: After watching the trailer, I think there is too much special.effects and the costumes appear to be video games like. Leehom should comb his fringe up like Godfrey and Archie. The title says Chilam Cheung so I was staring hard at the first pic to figure out which one is him, then to realise he is not in it lol.